I love grilling meats, but the one thing I miss is being able to create a great pan sauce from the drippings you get with stove top cooking. Often when we grill chicken I'll make some sort of dipping sauce, reduction, chimichurri or glaze to go with it. Most recently I was inspired by a big red pepper I spotted when I got my chicken out of the fridge. I decided to roast the pepper and make some sort of sauce out of it. I didn't want a cream sauce, but something lighter that would really let the taste of the roasted red pepper shine. 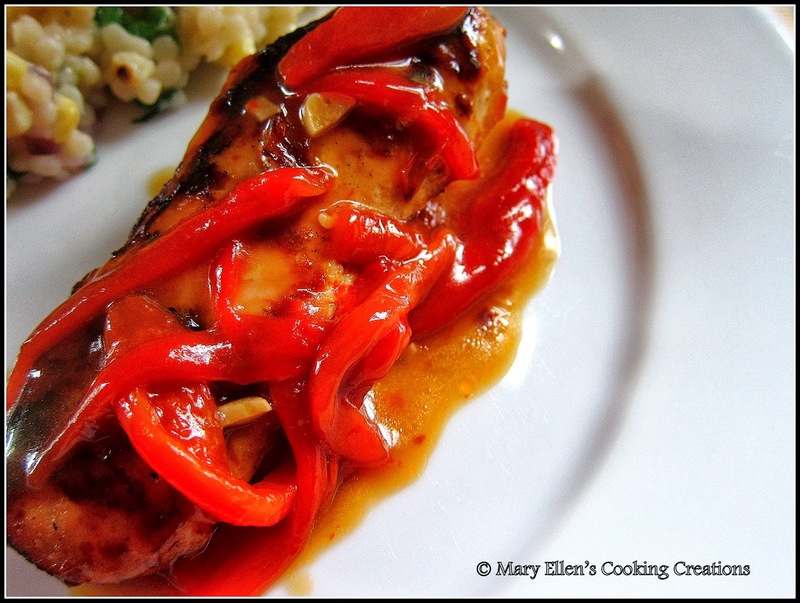 And I had already marinated my chicken, so I wanted something to complement the flavors in my marinade. I made this one up as I went along, and for my first try, I think I did pretty well! Next time I might chop the peppers smaller and use just a bit more red pepper flakes for heat. I loved the consistency of the sauce - thick and almost syrupy from letting it reduce for a while. The balsamic vinegar I used added a nice tang against the sweetness of the peppers. Mix all of the ingredients except the lemon and pour over the chicken (in a shallow dish or Ziploc bag). Let marinate in the fridge at least 8 hours. 1 hour before cooking, add the lemon juice. Grill the chicken over medium high heat for 8-10 minutes, or until internal temperature reaches 165. Top with the sauce. 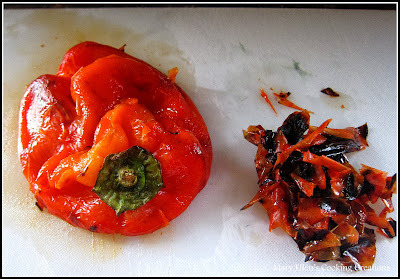 To roast your pepper, place it on a hot grill until charred on all sides. Place into a paper bag and roll the top to close it, or put in a bowl covered with plastic wrap. Let the pepper sit for 15 minutes to allow the skin to sweat. After 15 minutes remove it from the bag/bowl. Peel the skin off and then slice the pepper into strips, discarding the seeds and stem. Heat olive oil in a small sauce pan. Add the garlic, sauté 2 minutes. Add the peppers, broth, vinegar, s&p and red pepper flakes. Bring to a simmer and then lower heat. Let simmer, uncovered, for about 15 minutes. Wow, Mary Ellen - that looks REALLY good.